Google Chrome is widely used Internet browser and is commonly targeted by adware and malware authors. In cases that malicious changes are made on the settings, simply resetting Google Chrome to its default state can resolve issues. 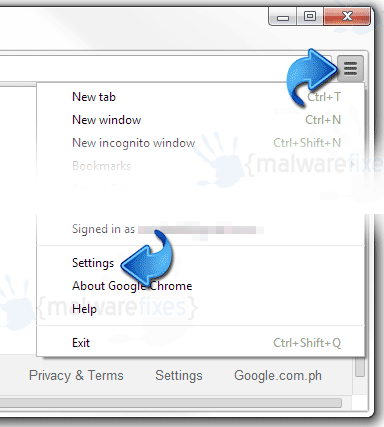 There are also instances that programs you have installed can change settings on the browser without your knowledge. In such instances, you may see unwanted extension, toolbars, or unknown search engine occupying the home page. Resetting Google Chrome will restore the browser to its freshly installed state, erasing all changes made by adware. Several options are provided to restore Google Chrome to its default state. There is no harm in trying all the choices, however, for quick and hassle free procedure, we recommend just downloading and running Google Chrome’s Software Removal Tool. If the tool didn’t work or is not compatible with your version of Google Chrome, you can use the other method. 6. Close the existing tab and restart Google Chrome. Please take note that the method is irreversible. After resetting Google Chrome, some of the previous configurations will be lost. Search engines and home page will be restored to its original state. Default startup tabs will be cleared and you can setup new one or let the browser open a black page. Contents, cookies, extension, and save configuration will be cleared right after you reset Google Chrome. 1. 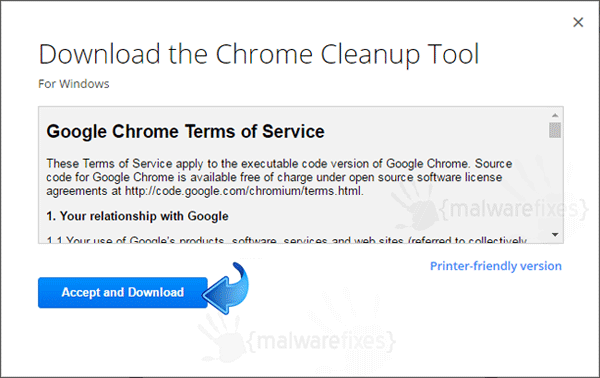 Download Chrome Cleanup Tool (this link will open on a new window). 2. When prompted for Terms of Service, please click Accept and Download. 3. Save the file to Desktop or any folder of your choice. 4. Once the download has completed, double-click and Run the file chrome_cleanup_tool.exe. 5. The tool will search the computer for malicious programs that produces toolbars, pop-ups, redirects, and home page hijacking. 6. After the scan, Chrome Cleanup Tool will display a list of malicious objects found on your computer. 7. Click Remove Suspicious Programs to proceed. 8. Next, Chrome will open a window prompting you to reset current settings. Click on Reset button.